One day next spring, the Israeli prime minister, Benjamin Netanyahu, may order roughly 100 aircraft of the Israeli air force to fly east toward Iran. When the Israelis begin to bomb the main sites of the Iranian nuclear program, they stand a good chance of changing the Middle East forever, of sparking lethal reprisals and even a regional war, of creating a crisis for Barack Obama and rupturing relations between Jerusalem and Washington, of inadvertently solidifying the rule of the mullahs in Tehran, of causing the price of oil to spike to cataclysmic highs, of placing communities across the Jewish diaspora in mortal danger, and of accelerating Israel's conversion into a leper among nations. If the strike succeeds, Israel will have banished the immediate specter of nuclear-weaponized, theologically driven, eliminationist anti-Semitism. It may also garner the secret thanks of the Middle East's moderate Arab regimes. And it will have succeeded in countering the spread of nuclear weapons in the Middle East. Since March 2009, I have interviewed roughly 40 Israeli decision makers about a military strike, as well as many American and Arab officials. I asked a question: what is the percentage chance that Israel will attack the Iranian nuclear program in the near future? A consensus emerged that there is a better than 50 percent chance that Israel will launch a strike by next July. In our conversation before his swearing-in, Netanyahu would not frame the issue in terms of nuclear parity. Israeli policy prohibits acknowledging the existence of the country's nuclear arsenal, which consists of more than 100 weapons. Instead, he framed the Iranian program as a threat not only to Israel but to all of Western civilization. Based on my conversations, the period of forbearance will come to an end this December. Robert Gates, the American defense secretary, said in June at a meeting of NATO defense ministers that most intelligence estimates predict that Iran is one to three years away from building a nuclear weapon. An Israeli policy maker told me: "In Israel, we heard this as nine months from June — in other words, March of 2011." The Israelis argue that Iran demands the urgent attention of the entire international community. This is the position of many moderate Arab leaders as well. Several Arab leaders have suggested that America's standing in the Middle East depends on its willingness to confront Iran. They argue that an aerial attack on a handful of Iranian facilities would not be as complicated or as messy as, say, invading Iraq. Barack Obama has said any number of times that he would find a nuclear Iran unacceptable. But the Israelis are doubtful that a man who positioned himself as the antithesis of George W. Bush would launch a preemptive attack on a Muslim nation. If they conclude that Obama will not launch a strike on Iran, then the countdown will begin for a unilateral Israeli attack. Netanyahu understands this challenge. To understand Benjamin Netanyahu, it is necessary to understand Ben-Zion Netanyahu, his 100-year-old father. Ben-Zion Netanyahu's most important work, The Origins of the Inquisition in 15th-Century Spain, upended the scholarly consensus on the roots of that bleak chapter in Jewish history. He argued that Spanish hatred of Jews was spurred by the principle of purity of blood. At a party marking Ben-Zion's 100th birthday, Benjamin credited his father with forecasting the Shoah and, in the early 1990s, predicting that "Muslim extremists would try to bring down the Twin Towers in New York." When Ben-Zion rose to make valedictory remarks, his speech was succinct and unambiguous: "From the Iranian side, we hear pledges that soon — in a matter of days, even — the Zionist movement will be put to an end and there will be no more Zionists in the world. ... The nation of Israel is showing the world today how a state should behave when it stands before an existential threat: by looking danger in the eye and calmly considering what should be done and what can be done." Benjamin Netanyahu frames the crisis in nearly the same terms as his father: "Iran has threatened to annihilate a state. In historical terms, this is an astounding thing. It's a monumental outrage." He argued that a crucial lesson of history is that "bad things tend to get worse if they're not challenged early." In a speech in June, Ahmadinejad, the Iranian president, explained Middle East history this way: "Sixty years ago, by means of an artificial and false pretext, and by fabricating information and inventing stories, they gathered the filthiest, most criminal people, who only appear to be human, from all corners of the world. They organized and armed them, and provided them with media and military backing. Thus, they occupied the Palestinian lands, and displaced the Palestinian people." Ahmadinejad's efforts to deny the historical truth of the Holocaust have the endorsement of high officialdom. The challenges posed by a nuclear Iran are more subtle than a direct attack. Netanyahu told me: "Several bad results would emanate from this single development. First, Iran's militant proxies would be able to fire rockets and engage in other terror activities while enjoying a nuclear umbrella. This raises the stakes of any confrontation that they'd force on Israel. Instead of being a local event, however painful, it becomes a global one. Second, this development would embolden Islamic militants far and wide, on many continents, who would believe that this is a providential sign, that this fanaticism is on the ultimate road to triumph." Third, an Iran with nuclear weapons would spark a regional nuclear-arms race. Other Israeli leaders believe that the mere threat of a nuclear attack by Iran will progressively undermine the country's ability to retain its most creative and productive citizens. Ehud Barak, the defense minister, told me that this is his great fear: "The real test for us is to make Israel such an attractive place, such a cutting-edge place in human society, education, culture, science, quality of life, that even American Jewish young people want to come here." This vision is threatened by Iran and its proxies, he said. Ephraim Sneh, a former general and former deputy defense minister, is convinced that if Iran crossed the nuclear threshold, the very idea of Israel would be endangered. If Israel is no longer understood by its 6 million Jewish citizens, and by the roughly 7 million Jews who live outside of Israel, to be a "natural safe haven," then its raison d'être will have been subverted. He directed my attention to a framed photograph on his wall of three Israeli air force F-15s flying over Auschwitz, in Poland. 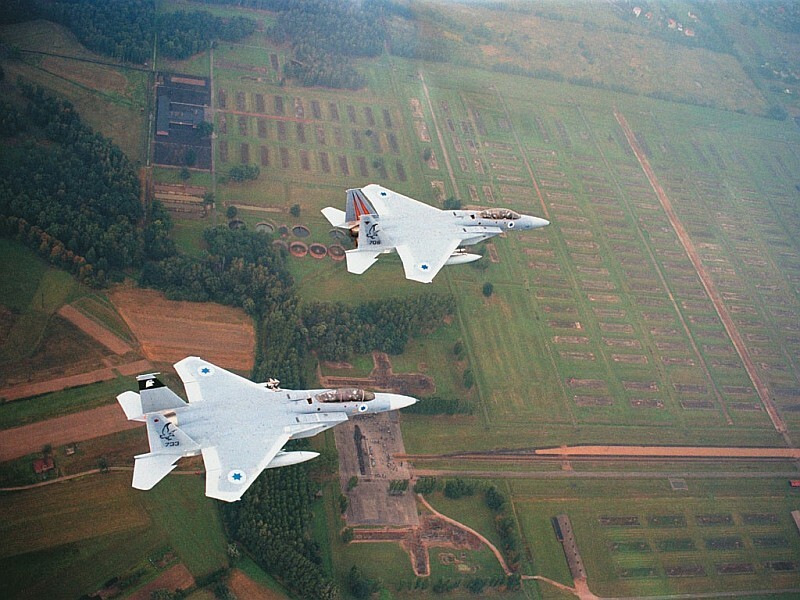 The Israelis had been invited in 2003 by the Polish air force to make this symbolic flight. The Israeli national narrative, in shorthand, begins with shoah, which is Hebrew for "calamity," and ends with tkumah, "rebirth." Israel's nuclear arsenal symbolizes national rebirth. David Ben-Gurion, Israel's first prime minister, was nearly obsessed with developing nuclear weapons as the only guarantor against further slaughter. Rahm Emanuel, the White House chief of staff, gathered several National Security Council officials to explain why the Jewish state should trust the non-Jewish president of the United States to stop Iran from crossing the nuclear threshold. "The expression ‘All options are on the table' means that all options are on the table," Emanuel told me. For more than a year, these White House officials have parried the charge that their president is unwilling to face the potential consequences of a nuclear Iran. Dennis Ross, the former Middle East peace negotiator who is currently a senior National Security Council official, said during the meeting that he believes the Israelis now understand that American-instigated measures have slowed Iran's progress, and argued that the sanctions may work: "We're pursuing a path right now that has some potential. It doesn't mean you don't think about everything else, but we're on a path." Several Arab officials complained to me that the Obama administration has not communicated its intentions to them. One Arab foreign minister told me that he believes Iran is taking advantage of Obama's reasonableness: "Obama's voters like it when the administration shows that it doesn't want to fight Iran, but this is not a domestic political issue. Iran will continue on this reckless path, unless the administration starts to speak unreasonably." Abner Mikva, the former congressman, federal judge, and mentor to Obama, famously said in 2008, "I think when this is all over, people are going to say that Barack Obama is the first Jewish president." Obama has been saturated with the work of Jewish writers, legal scholars, and thinkers. A large number of his friends, supporters, and aides are Jewish. When I made these points to one senior Israeli official, he said: "This is the problem. If he is a J Street Jew, we are in trouble." J Street is the liberal pro-Israel organization established to counter the influence of AIPAC and other groups. Emanuel had one more message to deliver: for the most practical of reasons, Israel should consider carefully whether a military strike would be worth the trouble it would unleash. Former Israeli air-force generals and strategists are cautious. An attack on Iran's nuclear sites would be difficult for Israel. "Our time would be better spent lobbying Barack Obama to do this, rather than trying this ourselves," one general told me. Successive Israeli prime ministers have ordered their military tacticians to draw up plans for a strike on Iran. Israeli planes would fly low over Saudi Arabia, bomb their targets in Iran, and return to Israel by flying again over Saudi territory. These planes would have to return home quickly. Israeli intelligence believes that Iran would immediately order Hezbollah to fire rockets at Israeli cities, and Israeli planes would be needed to hunt Hezbollah rocket teams. I visited Major General Gadi Eisenkot, the general in charge of Israel's Northern Command, at his headquarters near the Lebanese border. Eisenkot contended that the 2006 war was a setback for Hezbollah. But even if Israel's Northern Command successfully combated Hezbollah rocket attacks in the wake of an Israeli strike, political limitations would not allow Israel to make repeated sorties over Iran. America would look complicit in an Israeli attack. What if American intelligence learns about Israeli intentions hours before the scheduled launch of an attack? "It is a nightmare for us," an official told me. Israel will act against Iran soon if nothing or no one else stops the nuclear program. AR I back Israel — bomb the weapon-wielding theocratic eliminationists. My friend and colleague Jeffrey Goldberg wants his readers to be sure that the government of Benjamin Netanyahu wants it to be understood that, in the absence of an American decision to do so, Israel can and will mount such an attack soon. 1 International law and the stewardship of the United Nations will have been irretrievably ruined. 2 The Revolutionary Guards are the guardians of the underground weapons program and its success would enhance them. 3 The power of the guards to project violence outside Iran's borders would likewise be increased. 4 The same strategic ambiguity would apply in the case of any Iranian move on a neighboring Sunni Arab Gulf state. 5 There will never be a settlement of the Israel-Palestine dispute. 6 The concept of nonproliferation will go straight into the history books along with the League of Nations. The Atlantic cover story by Jeffrey Goldberg says that Israel is likely to bomb Iran within a year. Netanyahu comes off in Goldberg's article as so psychologically enslaved by his father as to be incapable of making autonomous policy decisions. When the subject turns from Netanyahu's psychology to Israel's psychology, the inclination to bomb Iran still looks none too cerebral. The trauma of the Shoah helps explain the political pressure to bomb Iran, but it's not a sound strategic reason to do so. Although many Israelis take seriously the prospect of Iran trying to annihilate them, Israel's policy elites by and large don't. They realize that Iranian leaders aren't suicidal and so wouldn't launch a nuclear strike against a country with at least 100 nukes. There's no way Iran's having a nuclear weapon would keep Israel from taking out Hezbollah missile sites in Lebanon as missiles from them rained down on Tel Aviv. If the Holocaust has left Israelis with an exaggerated fear of Iran's intentions, it has also left them with an absolute refusal to be cowed. Goldberg understates the blowback from an attack on Iran. An American-backed attack would feed the war-on-Islam narrative that is already starting to fuel home-grown terrorism in America. And he leaves you thinking that Israel will attack Iran very soon unless America does the honors. And this is the way Israel's hawks want the debate framed. That way either they get their wish and America does the bombing, or, worst case, they inure Americans to the prospect of a bombing and thus mute the outrage that might ensue after a surprise Israeli attack. But even from Israel's point of view, there's no sound rationale for bombing Iran. AR I agree with Wright — the Iranians are not yet proven to be weapon-wielding theocratic eliminationists. Flynt and Hillary Mann Leverett are unusual among former staffers of the CIA, the State Department, and the National Security Council in their deep affection for the Islamic Republic of Iran. They find that Iran embraces, "more fully and openly than Turkey, the project of building a state that is simultaneously Islamic and democratic". The Leveretts' whitewash is so extreme that it would be comical if it did not stray close to obscenity. President Mahmoud Ahmadinejad's comments on the Holocaust and September 11 are presented as adroit challenges to "the foundational premises" and "reigning narratives" of Washington and Israel. The Leveretts allude only vaguely to the execution of “a number” of opponents of the Islamic Republic. As apologists they undercut a case that needs to be made: US policy toward Iran has been a history of persistent demonization of the mullahs, lost opportunities, an urge to punish the Islamic Republic, incomprehension of Iranians who recall US support for Saddam Hussein in the past and Western intrusion going back to 1953, and threats that "all options are on the table" to pulverize the country's nuclear program. The Leveretts: "In American popular culture and opinion, Iran remains the embodiment of an extremist Islam that is no more rational than, and functionally indistinguishable from, the Salafi extremism of Al-Qa'ida and the Taliban." Their portrayal of the Islamic Republic as a prudent power in its foreign policy decisions is a needed antidote to wild comparisons of Iran to Nazi Germany and unpersuasive characterizations of Iran's leaders as apocalyptic madmen. Compared to its neighbors Iraq and Afghanistan, Iran has been a relatively stable country, and the Islamic Republic has survived because its leaders are shrewd and tough. The Leveretts contend that Iran has a soft-power edge in the region based on the regime's popular anti-Americanism and anti-Zionism. They say Iran is using this advantage "to encourage neighboring states to better represent their populations". In fact the Islamic Republic is working hard to defend Syrian dictator Bashar al-Assad in a brutal war. The Leveretts say Iran will win new allies like Egypt. The Leveretts: "For most Egyptians and other Middle Easterners, the 'main division in the world' is not between democracies and dictatorships but between countries whose strategic autonomy is subordinated to the United States and countries who exercise genuine independence in policymaking." President Obama will go to war rather than allow Iran to obtain a nuclear weapon, a development he now says is more than a year away. Western powers point to several indications that the Iranians are acquiring the technical capacity to produce nuclear weapons. But intelligence agencies have not detected an Iranian decision to go for a bomb. The Leveretts grasp the political centrality of the the nuclear program within a revolutionary system that values independence from the Western powers. They argue that Iran's intent is to achieve a nuclear threshold similar to Japan's as a form of strategic leverage and a demonstration of technological prowess. They oppose a war: "American decision makers need to acknowledge that the United States has to come to terms with the Islamic Republic." Their proposal for a new initiative by Obama comparable to Nixon's going to China seems utterly fanciful at this stage. AR Perhaps we can get by without bombing after all — the regime is halfway rational.